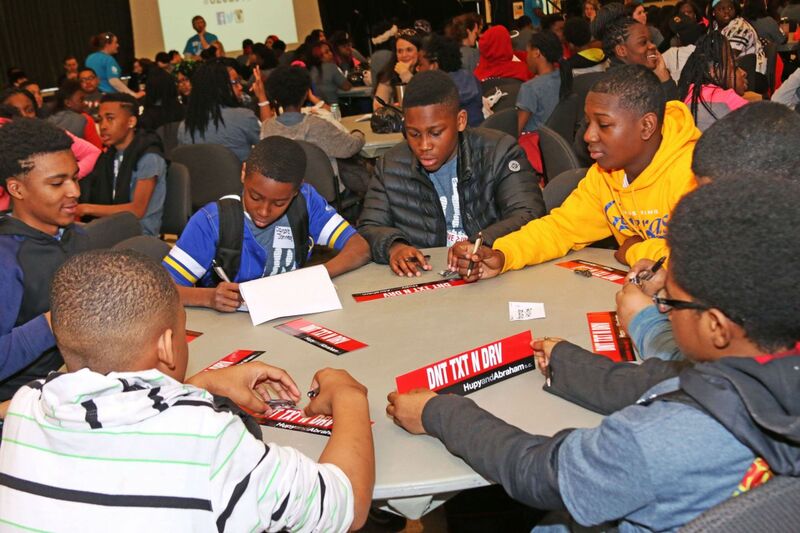 Hupy and Abraham Supports Young People Promoting Peace | Hupy and Abraham, S.C.
Students from Rufus King High School signing the Don't Text & Drive pledge. Monday, April 11, was the third annual Serve 2 Unite Peace Summit in Milwaukee. Students from across the city gathered at the University of Wisconsin-Milwaukee to meet and talk about important issues that divide our communities, including violence and poverty. The timing of the event couldn’t have been more important after four teenagers were shot in Milwaukee over the weekend. With the help of the group [email protected], over 500 “Peacemakers” from over 20 Milwaukee area schools attended the 2016 Serve 2 Unite Peace Summit, along with global mentors like Mohammed Ali Aerosol from Birmingham UK. As a proud sponsor of the summit, Hupy and Abraham took the opportunity to educate students on the dangers of texting while driving, and encouraged them to sign a pledge to never text and drive. Serve 2 Unite is an organization that reaches out to inner-city youth to spread a message of peace and compassion while empowering children to set a positive example. In the wake of the Sikh Temple of Wisconsin shooting in August 2012, the Serve 2 Unite Peace Summit taught young people to become advocates for peace and encouraged them to use art as a form of activism. One of the best things to do for the community is to enlighten and encourage young people to become involved and speak out against violence. Hupy and Abraham is proud to support community events like the Serve 2 Unite Peace Summit. The firm also recently sponsored the Make Believe Ball to benefit First Stage Children’s Theater, as well as the Sojourner Family Peace Center’s 2016 Fashion Show to benefit victims of domestic violence.